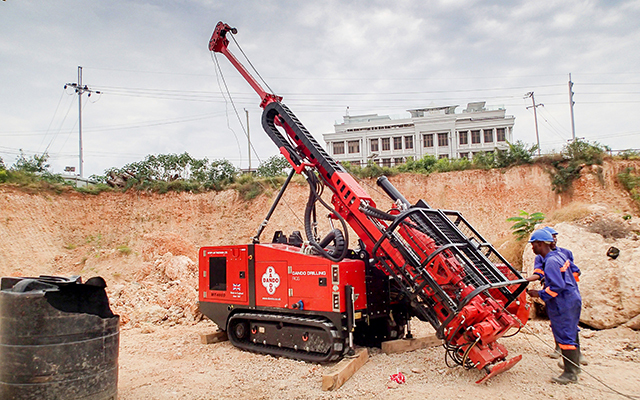 Norplan Tanzania Ltd recently purchased one of Dando’s latest multipurpose rigs, the Jackal 4000, for their geotechnical drilling operations. Requiring a variety of different site investigation drilling methods, Norplan have enjoyed success using the rig for Geobor S coring to depths of 30m and H-Wireline to 80m. They are also using Shelby tubes and a hydraulic piston sampler to retrieve very high quality undisturbed samples where necessary. Dando’s standard rotary head for the Jackal 4000 (Formerly the Multitec 4000) is more than capable of these depths and diameters when used on the standard mast with 4 tonnes of pullback. The head is mounted on a 3 position hydraulic carriage that also mounts Dando’s 3D percussive hammer. The hammer allows Norplan to retrieve U4 samples and run SPTs as part of their site investigation work. The 3D hammer system also accommodates the complete range of Dando’s duplex drive tooling including simultaneous windowless sampling and casing and other common tests such as dynamic probe. The specially designed hammer ensures no weight is placed on the resting drill string prior to a hammer strike, ensuring that the most accurate data is recorded. The fully modular design of the Jackal 4000 allows a tremendous number of specification options and truly make this a rig in a class of its own.